An Armor-level Insect Digimon that evolved through the power of the "Digimental of Knowledge". Like Flybeemon, Honeybeemon and Butterflamon, it is a mythical Digimon that appears during a large Kunemon outbreak. Above all, Mothmon has a rough temperament, so it possesses aggressive habits. The phosphorus powder stored in its wings contains the ingredients for gunpowder, and there are occasions when it showers this powder to intimidate the enemy. 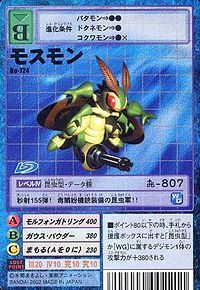 Its Special Move, "Morphon Gatling", shot from the gatling gun growing on its tail, is able to fire 100 bullets per second, so there is no way of escaping from this bombardment. 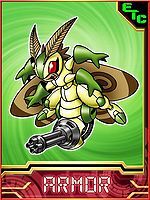 Also, the bullets it fires are made of phosphorus powder, and because they penetrate deep inside the body and explode, Digimon that are defeated in battle against Mothmon will become a terrible sight to behold. 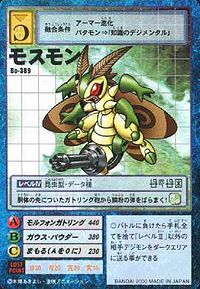 An Insect Digimon that evolved due to the "Digimental of Knowledge". Special Move - Its "Morphon Gatling" is able to fire 100 bullets per second, so there is no way of escaping from this bombardment. Morphon Gatling  モルフォンガトリング Morufon Gatoringu Fires 100 shots per second, and it is impossible to escape from this gunfire. Mothmon is only obtainable as a collectible card. Its card is part of the Digimental of Knowledge (知識のデジメンタル Chishiki no Dejimentaru) set. Mothmon is available as a Digimon Medal. 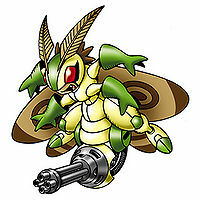 It fires bullets that scatter moth scales from the gatling gun on the tip of its abdomen! It fires 155 bullets per second! This insect militant is equipped with a poisonous scale-firing machine-gun! !